It said it would conduct a review next year to ensure that the legislative and regulatory framework is in place for such vehicles to be incorporated on Britain's roads. By mid-2017 it is planned that 100 fully autonomous vehicles will run on the town's pathways along with pedestrians, using sensors to avoid collisions. 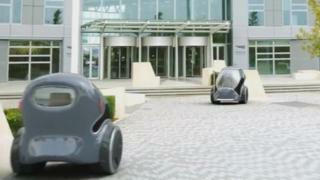 The plans for self-drive cars were announced in the chancellor's National Infrastructure Plan. "I call it mobility on demand. You pop out your mobile phone, say where you want to go and how many people and in a short amount of time a vehicle rolls up," said Brad Templeton, software engineer and adviser to Google on its self-drive car project. "People will be like the millionaires of old where you just had a driver that did everything. These cars will worry about recharging, parking and refuelling. They will drive down a road without you paying much attention to it," he said. Such cars will make cities both safer and greener, he thinks. "It will radically change the amount of energy we use, how congested our streets are and eliminate most of the parking lots that take up a huge amount of space in our cities. "Humans kill 1.2 million people in car accidents each year so the idea of being able to make a safer vehicle is very appealing," he said. "I think only the barristers will find it the most interesting question," he said. "For me the more interesting question is whether a machine is more liable than a drunk driver. Countries that decide a machine is more liable will slow the development of this technology," he added.